We have a bumper crop of acorns this year from the valley oak tree in the alley behind our house. I read that It takes 50 years for an oak tree to get it’s acorns and can drop 50,000 of them yearly. The most amazing fact is that one oak tree can provide enough oxygen for eight people for a year! The squirrels and blue jays have been enjoying them as well as the deer. Acorns are the food of choice for deer, this time of year. They’re low in protein but high in carbs and fats. 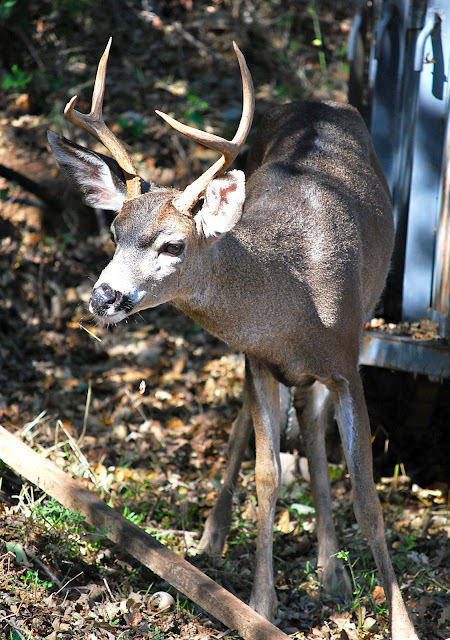 Because they’re so easily digested, the deer spend a lot of time eating them in order to put on weight for the winter. Every afternoon, since the acorns started dropping, the deer have been parading down the alley behind my house. Today, this guy brought his whole extended family to lunch on the acorns. And several of this daughters, including his youngest. Watching the parade of deer from the top of our fence, my Director of Pest Management thinks she could take one or two of those deer down. The Garden Supervisor, watching Pest Management, thinks she is delusional. I think I’d better get out there and get some of those acorns for myself before the deer eat them all. I found a recipe for Apache corn cakes that I’d like to try. My Recession Kitchen is Featured on "the Kitchn"